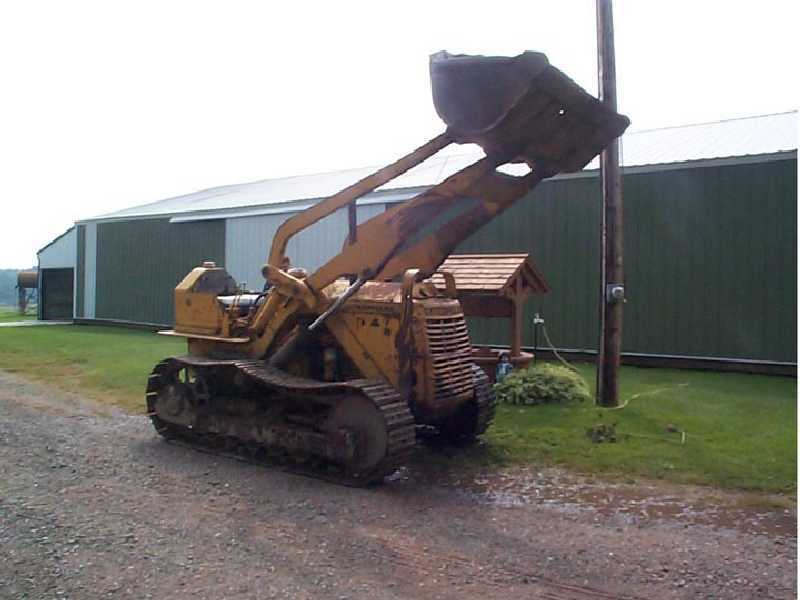 In Sept 2003 we purchased a 1948 Cat D318 engine (that's the size in a 1950s D6). It is stuck from sitting for several years. We have to get it running and come up with a 2.5:1 reduction and then install it on our sawmill and make more sawdust! We have completely gone through the engine prior to using it on the mill. With that done we will have a lifetime capable engine. You can see the progression of the restoration from mid November 2003 until mid April 2004 by clicking here. 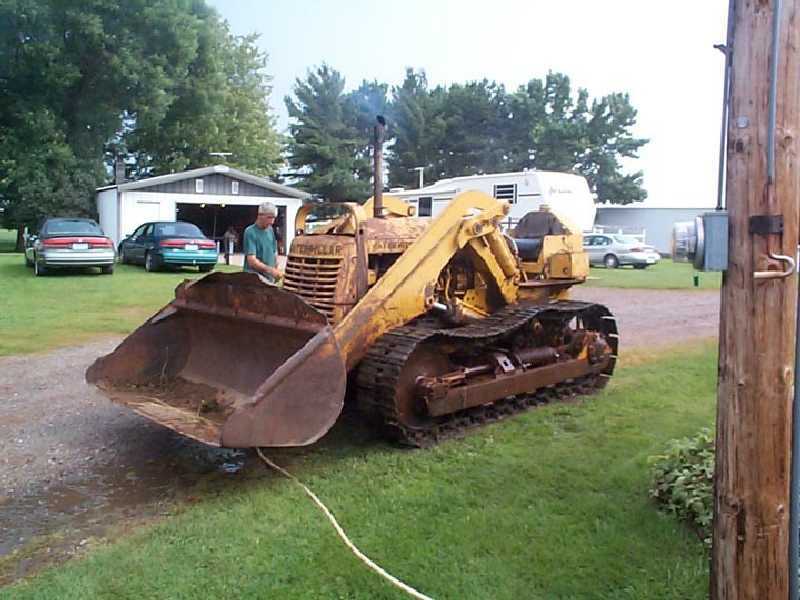 This is my Dad's Cat, a Caterpillar D4 S/N 7U26480, built in 1954 with a Cat 4S dozer on it. Our uncle bought this Cat in the early 1970’s. He passed away in April 2001 and we acquired the Cat from his widow in September 2002. He quit using it, no small part due to the undercarriage being worn completely out. There is something wrong in the diesel engine, we think it is an exhaust valve, and various bushings in the Cat that have to be replaced. We are planning on repairing it and painting it the winter of 2002/2003 when it is cold and snowing outside. Here you can see the sprocket that is completely worn out. The bushings in the tracks have been turned earlier and it was used enough after that that they were worn though on both sides. Trying to make the Cat turn now is a challenge. This sprocket will just slip at the slightest amount of stress from the rails. The rail height is only 3 1/8 inches, v/s new being 3 3/4 inches, worn well beyond the useable point. You can see the progression of the restoration from mid October 2002 until mid June 2003 by clicking here. My brother and I got this Cat from our late uncle. It is a Caterpillar D4 with a HT-4 Traxcavator loader, Serial number 7U27365, built in 1954. We have taken the Cat to several antique tractor shows since we completed the restoration. Here we are the Andersons Rock Creek Relics show 2003 in Rock Creek, MN. This is the first show we took the Cat to. 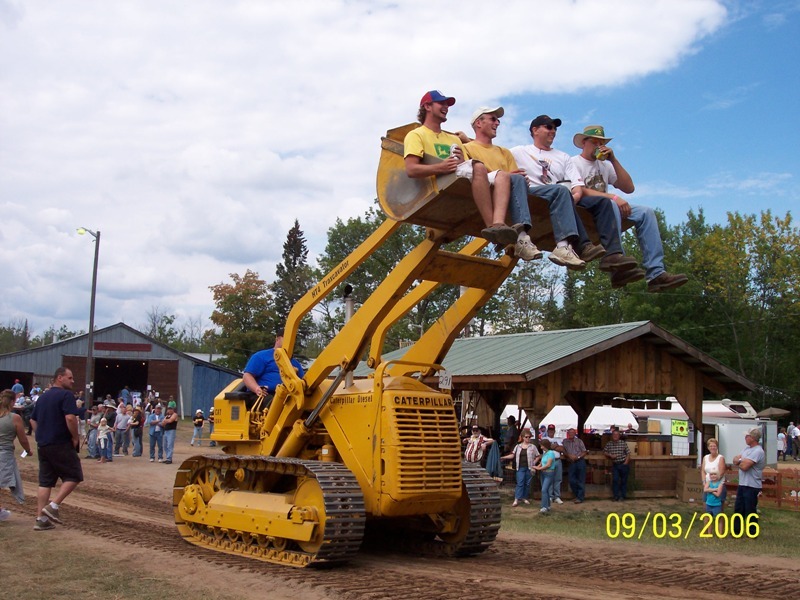 This is Stearns County Pioneer Days 2003 at Albany, MN. Here we are loaded up and on our way to the Western Minnesota Steam Threshers Reunion 2004 at Rollag MN. We have on our two Cats and a Cat R5 of a friend. That's my brothers semi tractor out in front. A 2000 Peterbilt with a 475 hp Cat under the hood. 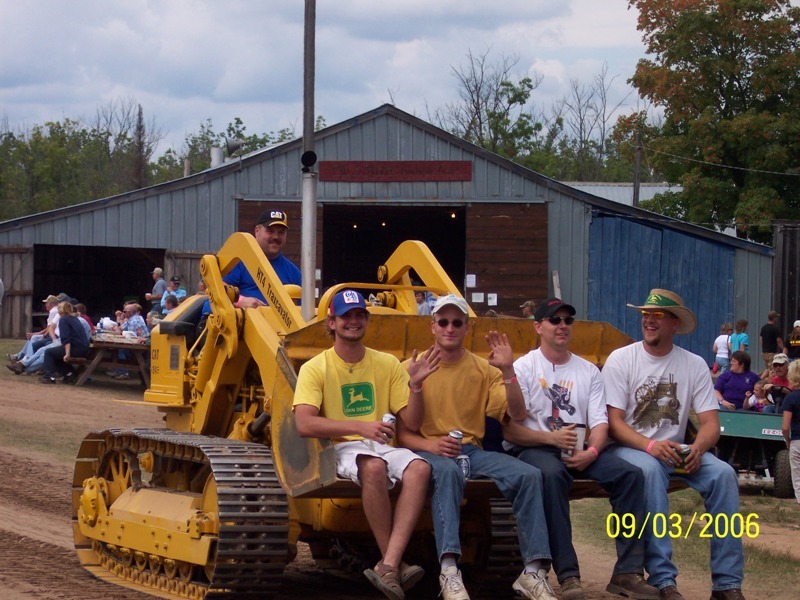 This is the White Pine Logging & Threshing Show 2006. In the bucket is some friends that were also at the show.